Main Attractions: Good trail system, ponds, bogs, open fields, woodlands, top notch visitor's center (art gallery, greenhouse, raptor viewing). New Canaan Nature Center is a perfect place to bring young children and introduce them to nature. It's also great for those looking for an easy, peaceful stroll through interesting terrain. New Canaan Nature Center (part of the Audubon Society) is laid out in a manner that creates little worlds with everything within close proximity of the main parking lot. The center is located just few miles north of New Canaan's business district in a residential neighborhood. The way the grounds are designed, you'll be thinking you're much farther out in the woods or open fields than you really are. The center has a large outer loop along with other smaller trail systems that make for a nice web of paths. 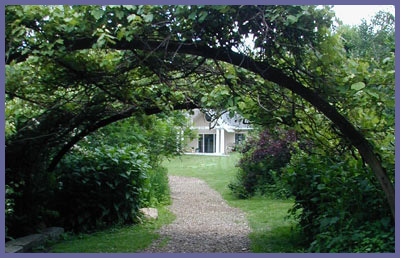 Open fields, woodlands, ponds, bogs, marshy areas, and beautiful gardens can be explored within a 20 minute walk. If you take your time and explore the whole trail system you can make for a longer hike and you're likely to encounter an abundance of wildlife. Because this nature center is in southern Fairfield County where open space is hard to find, the animals flock to the center and use it as a haven from suburban sprawl. Bird watching is extremely popular here and there are viewing platforms and plenty of strategically placed benches to aid the bird watching fanatic. Not only have the people at New Canaan Nature Center created a great trail system with varying ecosystems, they've also built one of the best nature facilities in the state. The Visitors Center (museum, art gallery, education center, and large greenhouse) is quite a site to behold. Across the parking lot is the Animal Care Building with its first rate raptor (hawks, falcons, etc.) display and outdoor amphitheater for animal viewing and guest speakers. The main area also has picnic tables, manicured gardens, and plenty of areas to explore before heading off onto the trail system. If you love to paint or are into photography then you'll certainly want to visit New Canaan Nature Center with all the natural and architectural beauty. Directions: New Canaan Nature Center is about one mile north of New Canaan's business district on the left hand side off Route 124. (144 Oenoke Rdg) There are many ways to get to the center depending upon where you are coming from so your best bet is to plan a course using Mapquest to 144 Oenoke Rdg in New Canaan. The following was taken directly off of their website, www.newcanaannature.org. Click "Where We Are" near the top left of homepage. From the Merritt Parkway (route 15), take exit 37. Make a left at the end of the ramp onto route 124. You will pass over the Merritt Parkway and head north along South Avenue into New Canaan. Follow route 124 through town. At the third traffic light turn right onto Cherry Street. At the next traffic light turn left onto Main Street. Main Street becomes Oenoke Ridge. The New Canaan Nature Center is located about 1/4 mile north of town on the left at 144 Oenoke Ridge. 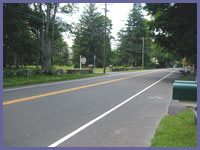 The driveway is on the left, just past St. Mark's Episcopal Church (on the right) and just before you reach the Presbyterian Church (on your left) or the Roger Sherman Inn (on your right). Southbound on I-95, take exit 11. Make a left at the end of the ramp onto route 1. In approximately 1 mile you will pass under a railroad bridge and then a traffic light. At the next traffic light turn left onto route 124. Follow route 124 north, crossing over the Merritt Parkway and into New Canaan. Follow directions above. Northbound on I-95, take exit 11. Make a left at the end of the ramp onto route 1. In approximately 1 mile you will pass under a railroad bridge and through a traffic light. At the next traffic light turn left onto route 124. Follow route 124 north, crossing over the Merritt Parkway and into New Canaan. Follow directions above.